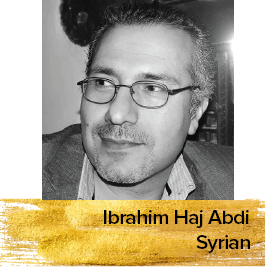 Ibrahim Haj Abdi is a Syrian film critic and a journalist based in Germany. He received a BA in Journalism from the University of Damascus in 1996, and worked as an editing secretary at the Erm News site in Abu Dhabi from 2011 to 2016. Currently, he writes for several Arabic newspapers and magazines. He has two books under his belt, one published in 1996 and the other published during the 36th Cairo International Film Festival in 2014.